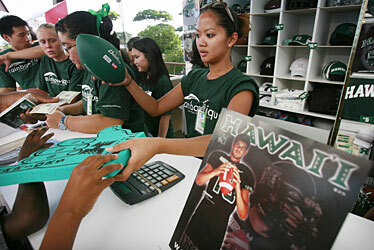 University of Hawaii Warrior football souvenir sales are brisk at the Rainbowtique outlets at Aloha Stadium. Here, Karri Villanueva sells foam hands and footballs. It's about 45 minutes before kickoff and Jody Van Sciver of Kahala is perusing the souvenirs at Aloha Stadium even though he's already decked out in University of Hawaii football apparel. He's wearing a UH hat, a football jersey with quarterback Colt Brennan's No. 15, and a T-shirt underneath with the words "Warrior Nation." A "huge Hawaii fan," Van Sciver estimates he spends $300 every year on UH football merchandise. "I buy jerseys, hats, T-shirts and anything about UH," he said. Everywhere you look around Aloha Stadium, green and black are the colors of choice. There are conventional items like shirts, jerseys, caps and visors; unconventional souvenirs like foam spirit-finger shakas; and miniature footballs and helmets that can be used to collect autographs. Some people show up for the game with T-shirt slogans featuring Brennan, undoubtedly the most popular Warrior this year. Even though NCAA rules prohibit UH from featuring Brennan's name or picture on merchandise, it doesn't stop individuals from producing Brennan-related T-shirts. One shirt read: "Vote For Colt ... HI's Man 2007," a clever reference to his Heisman Trophy candidacy this season. "You see considerable more people wearing UH logo items than before," said John McNamara, UH associate athletic director for external affairs. "There's a real pride in the community on what the football team has accomplished and I think the brand has never been stronger." So far this year, UH's corporate sponsorships are tracking last year's numbers with about $2.1 million in cash and $500,000 in trade, according to McNamara. None of the revenue generated from UH football merchandise sales goes to the athletics department. Instead, it goes to the UH bookstore to support the educational program. Souvenir sales at the Rainbowtique, a part of the UH bookstore, are up "moderately" over last year at this time, according to Didot Soewondopranoto, a manager for the apparel and souvenir shops at Ward Centre, the Stan Sheriff Center, the UH bookstore and on game days at the stadium. Soewondopranoto said he can't disclose financial information but said the university's centennial anniversary this year also is helping boost sales, as is the annual success of the women's volleyball program. "But I'm sure the football team is playing a big part in our success," he said. Carolyn Tanaka, associate vice president of external affairs and university relations, said UH has generated more money in licensing wholesale fees this year than a year ago. However, because the licensing revenue is received from all university marks, she said, she can't attribute the increase solely to the football team. Any party who makes a product with university marks on it, which includes the athletic "H," is required to pay a wholesale fee of 8 percent to the university, Tanaka said. Those fees, which are different from what UH receives from retail sales, could be for such items as T-shirts, glass mugs and key chains. Bill Bryant, assistant athletic director of compliance and eligibility, acknowledges there are many T-shirts around that are not being licensed. "Everybody does their own thing ... because everyone wants to be involved," he said. "Everyone wants to be like Colt."